3. A big back yard - which is pretty rare in my neighborhood. Walls can always be changed, right? So we did. The former owners had added on a new living and dining room downstairs, with a huge master suite upstairs. They had added 9 ft ceilings downstairs in the new addition (yay!). 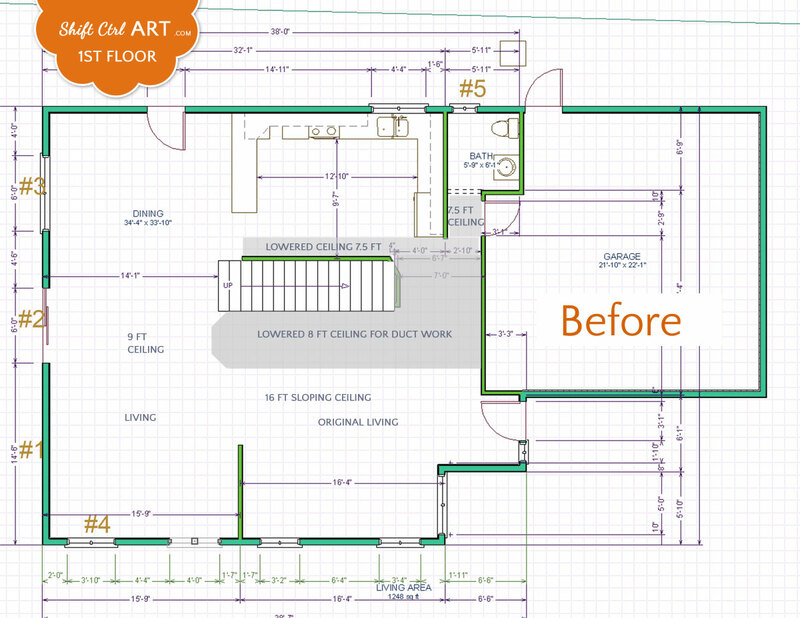 The floor plan had created a need for compromises with the duct-work. As you can see, they had run into some challenges with the duct-work (The gray shaded area). Lots of different ceiling heights and most notably a heavy lowered ceiling next to the staircase that ended in an octagonal shape in the middle of the living room. The stair case was extremely prominent with a reddish-orangy oak color and tons of black extruded aluminum railing with lots of "detail". The stair case also ran into the dining-room, making the room feel smaller. Further you could not turn on the light over the stairs, but had to jog down to the front door to turn on the lights. In the kitchen the duct-work ran along an empty wall creating a bulkhead with nothing under it. This had been accented(!) with cabinet colored filler strips. In the living room you may notice a short wall between the original and new living rooms. This wall was so short that the seating arrangement stuck out behind it by about half. It made the living room seem smaller and it made the original living room practically unusable. Something the previous residents had struggled with too, we could tell when touring the house. So there were a few things that we wanted to fix. Add more storage - the house had almost none. No coat closet for instance. In the kitchen we wanted to fix the duct-work, move the fridge to the long empty wall and create a full wall of storage and get rid of the 45 degree angled wall at the same time. These were the biggest part of our plans for the first floor. Here you can see the living room that we have shared so far, if you haven't already. Demo in the Kitchen Part II - let the remodeling begin! 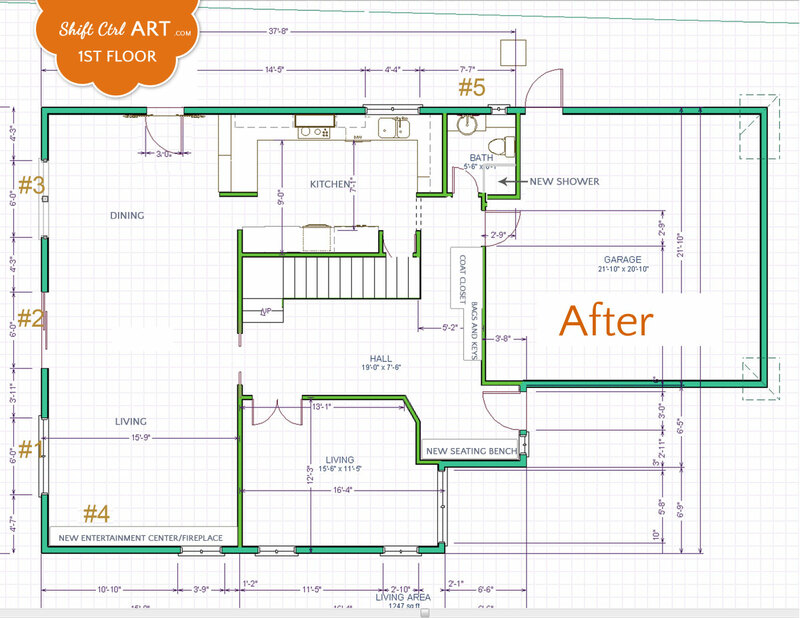 This article: 1st floor plan - before and after first appeared on http://ahomefordesign.com.